What better way to start them off on their learning journey than with our Recycled Plastic Infant Ruler. Specifically designed with young children in mind, we took a classic ruler design and turned it on its head. Using colour alongside line and number indicators, this rulers provides a visual tool that makes measuring and drawing the perfect straight line considerably easier. They are manufactured from an entirely recycled plastic material. Providing durability throughout use and a wipe clean surface, this also makes each one lightweight enough to slip into backpacks and pencil cases alike. Each edge and corner has been gently rounded off to minimise the risk of injury and make them safe for use, even by the youngest of children. On to the smooth, flat surface, a bright yellow and deep red contrasting design has been printed. As well as drawing in their attention, the block design also provides a clear visual way of measuring. 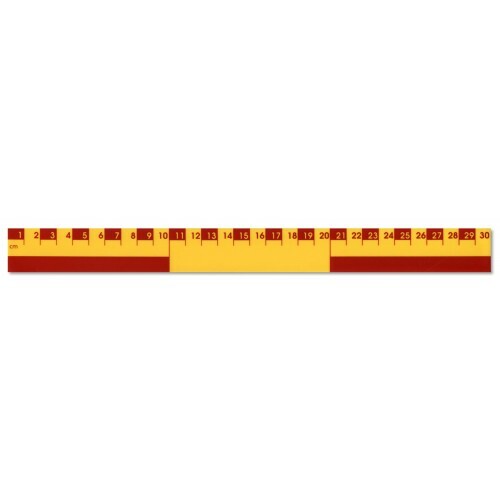 Each cm marker alternates between red and yellow while the three 10cm marks are clearly blocked out in a similar fashion. An effective way of easily teaching children and adults alike the correct way to measure between two points or create a perfectly straight line. Aimed towards educational environments, we provide these infant rulers in bulk order options. For orders over 10, we provide each one at just £0.48 and for those over 100, this drops to just £0.36 per ruler. They have been designed to work within your budget while offering durability and functional design.